A psychological suspense novel that is “a mind-bending ride. Just when you think you’ve discovered the truth, a new secret is revealed.” (Wendy Walker, author of All Is Not Forgotten). I look up at the TV screen, and my twin brother’s face is splashed across it, life-size. It’s a shock that makes my breath catch. This is my brother as an adult, my brother who I last saw fifteen years ago after the fire that killed our parents, covered in soot, clutching a lighter in his hand, his knuckles stark white against the dirt and ash. Everyone always said he’d grow up to be a heartbreaker. But his face has gone gaunt instead. The stubble on his cheeks and chin is patchy, and his eyes look dull and dark. My first thought is that it’s not him. Not my beautiful brother, the golden boy who everyone loved. Yet, deep down, I’ve always known this would eventually happen. 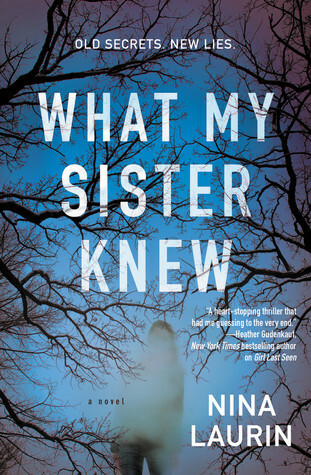 What My Sister Knew by Nina Laurin is a psychological thriller that certainly begins with a bang to catch a readers attention. Andrea has been in a car crash wrapping her vehicle around a tree and during her in and out of consciousness she vaguely recalls seeing a man in the road. As Andrea is checked out at the hospital we begin to learn more about her and her story. It seems that Andrea is a twin that hasn’t seen her twin brother in fifteen years, not since the fiery death of their parents by her brother’s hand. Andrea spent that time with adoptive parents and Eli in prison for the murder of their birth parents. And now Eli is out and seems to be wanted for murder yet again. The story is one that is easy to fall into a rhythm reading as it begins and as you learn of the horrible past it begins to flash back to that time fifteen years ago to catch readers up on the twins childhood and their parents death. There are also little snippets from a book that was written about the murders. The thing for myself as a reader is that I read a ton of fiction and thrillers and as soon as this one got going I had a pretty good idea in my head of what may or may not happen. As it went along I just seemed to be checking off the boxes heading to my outcome so I was not shocked when I was right at the end making this one a little too predictable for me so while not a bad story and one with nice writing it turned into more of a time killer than something I’d remember for years to come. 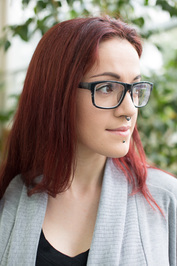 Nina Laurin, author of Girl Last Seen, studied Creative Writing at Concordia University, in Montreal where she currently lives. She has published speculative short stories in various e-zines and anthologies over the years and her narrative nonfiction piece, “On Happiness” is soon to be published in the local literary journal Cosmonauts Avenue. She blogs about books and writing on her own site, thrillerina.wordpress.com. It’s funny, I hate giving a less than stellar review, but I think being able to say something wasn’t great makes my reviews have more weight when I do think something is great. Good job on giving a great review that something was less than exceptional! Thanks Theresa, you are very right though, if we love them all then people would question why since everyone will eventually pick up something that doesn’t quite suite them for one reason or another. Writing the lower reviews isn’t much fun but I just try to stay polite and point out what made me lower my own rating. Great review, Carrie. This certainly sounds interesting based on the premise and that first scene at the accident. Sorry to hear about the predictability though. Thanks Carla, I think for me it’s a matter of making everything else completely shine and stand out if the outcome will be obvious and then I may still love it. This one however didn’t do that so it was just a ride to the end to see if I was right.